How to Calm Anxiety at Night. Solutions for Better Sleep. Are you someone who yearns for a good nights sleep but just can’t as your mind is working overtime? This has been me at many points in my life, so I know that lack of sleep can affect every single part of your day. Your energy, your mood, your relationships, your focus. Every task and interaction you have is impacted if you can’t get enough zzzz’s at night. You may not be sleeping due to stress and anxiety and this lack of sleep will actually make you more stressed and anxious. It’s a vicious cycle. So let’s talk about some solutions to quiet your mind at night. 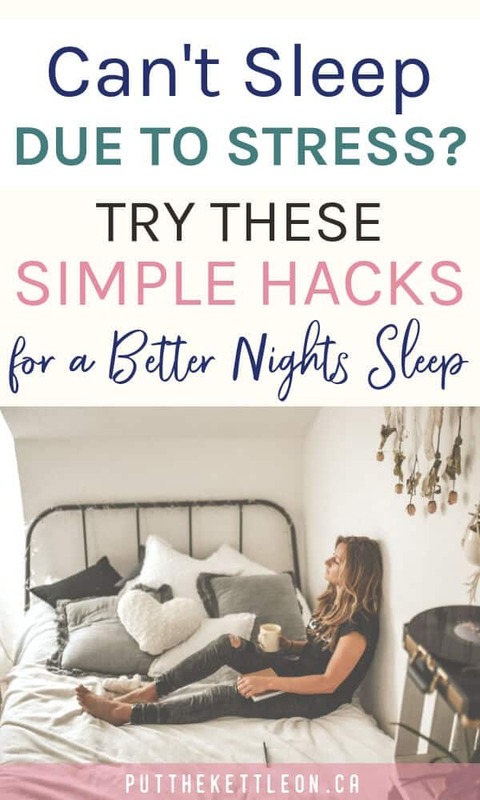 These tips to help you relax at bedtime are hacks I’ve been using over the years, especially when stress get’s the better of me. #1. Figure out what you are anxious about at night. By knowing what is causing your stress you can start to do something about it. Whatever is triggering you – write it ALL down. Every single thing. This way you can see in black and white what your stressors are. 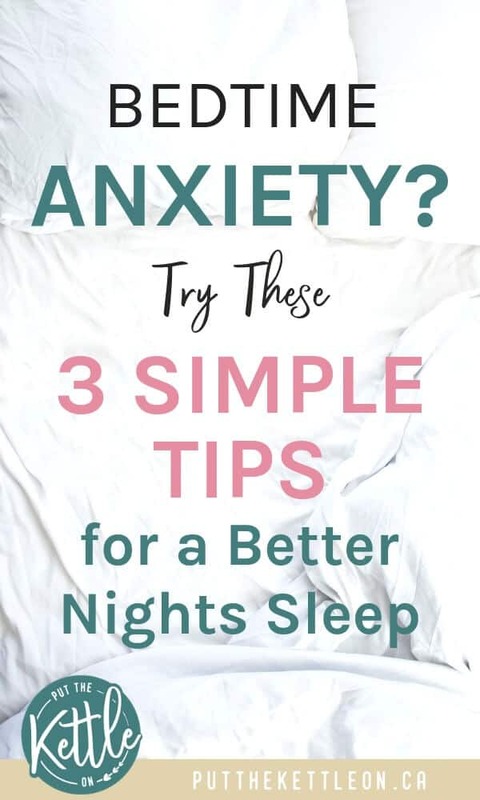 You may have not even realized exactly what has been causing your anxiety but going through this process will help to uncover what’s been keeping you up at night. #2 Don’t Be a Procrastinator! Sometimes our nighttime stress comes from all the things we need to do in our lives. You know you have made a big list in your mind – probably too big. This is causing your mind some serious stress. Many times anxiety can be our bodies way of letting us know that we need to come up with an actionable solution. Once you have it all written down, highlight your 5 biggest stressors. Now that you have determined the biggest items that are affecting you, write down 3 action items you can take to reduce your stress. Once you have done this you can make a plan for everything else on your list – but just focus on the top 5 right now. You will find that once you know what you’re doing and you have a plan — you won’t think about these stressors much at night. You can rely on the fact that you’ve already started taking care of things. This is a good feeling! Okay, so this statement makes sense in all parts of our lives! If you go to bed wondering what you’ll be wearing tomorrow, how long it will take you to get to an appointment, what you need to make for lunch or trying to figure out next steps on a big project – you aren’t going to get any sleep! Do yourself a favour and dedicate 30 minutes at night to making sure you have everything together for the next day. It may seem like a pain at first, especially if you are tired, but trust me – once you get the hang of it your 30 minutes will actually reduce to 10 or 15 minutes. Take a mental note or review your calendar for the following day. See what you have going on. If you have a big project you’re working on- write down all next steps or action items instead of trying to remember them the next day. Now that we have discussed 3 key ways to help you reduce nighttime anxiety, let’s talk about some sleep aids that I personally swear by! Do your children have anxiety at nighttime? Make sure to check out this helpful post from Colleen at Good Bye Anxiety, Hello Joy: Ways to Improve Bedtime anxiety in Children. Natural Sleep Aids to Reduce Anxiety and Get to Sleep! 1. Make yourself a non-caffeinated hot drink. This Golden Milk Tea or some call it a Golden Latte is my favourite. It’s made with turmeric, cinnamon and your choice of non-dairy milk. It makes me really sleepy and extremely relaxed. Another great option is camomile tea. 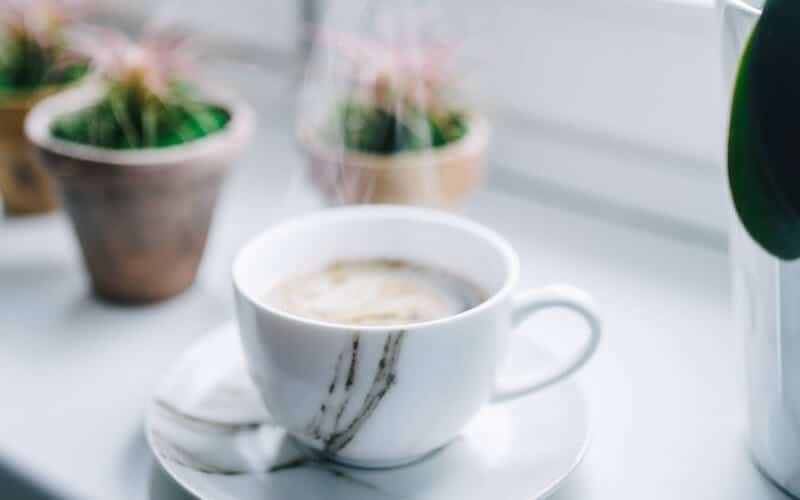 It is said that the relaxing compounds in camomile tea can help reduce stress and anxiety, so enjoy a cup in the evening as much as you can. Add 1 drop of lavender essential oil to your night cream. Simply put the drop in your hand with the night cream and massage into your face and neck. Diffuse your lavender oil. 4 to 5 drops is a good amount depending on how pure your oils are. Here is the first diffuser I started using. It’s affordable and works great. If you’d like to learn more about essential oils and how important it is to choose the right brand for quality and purity, feel free to shoot me an email – yolanda@putthekettleon.ca – and I can share some insightful information. Reading before bed is a great self care activity but it’s also a good way to encourage sleep. Ever notice as you’re turning the pages before bed that your eyes are starting to close? You can barely make it to the next page? This is a process that can be enjoyed and also preps our body for sleep. My current bedtime read: Brida by Paulo Coelho. 4. Keep technology out of the bedroom. Are you someone who charges your phone next to your bed? This is a no-no! Who wants to be woken up by notifications and texts? This means you have noise and light pollution in your bedroom. Not to mention who knows what harmful effects a mobile phone could have charging next to your head all night long?! No thank you! 1. Keep a notebook or journal beside your bed. This is perfect for the racing mind. Do you have something you keep thinking about or need to remember? Write it down and deal with it in the morning. 2. Treat yourself to a noise machine. This is my absolute favourite sleep aid! I am honestly obsessed. Check out my sound machine here. 3. Keep water beside your bed. No one needs more reasons to be woken up in the night. In the winter we can get dry throats from the thermostat, so keep water on hand just in case. Do you suffer from stress and anxiety at night? The lavender linen spray is such a good idea! I’m a huge fan of writing things down too or else I’ll dwell on it all night and keep myself up. These are great tips. For me it is usually because there is much going on or up coming and it stresses me out. Warm tea usually helps. Great tips here. I used to write down the things I had to do the next day and this would help me not stress. I felt that since I had them writte down then I was sure that I wouldnt forget anything so no need to stress! Thanks D. Exactly! It’s a simple and efficient way to make sure you’re on top of things so you don’t need to worry when you should be sleeping! These are all great ideas. I also use a noise machine or a fan, along with no technology, essential oils, and prepping for the following day before heading to bed. I like the idea of a notebook by the bed to write down thoughts that pop up. Hey Colleen 🙂 Nice – you are a fellow noise machine/fan lover! Some great tips. I really appreciated coming across this post, as this is definitely something I have been feeling lately. Everything seems worse at night! I like your idea of writing everything down! Hey Alexandra! Glad to hear this was helpful for you 🙂 Writing down your stresses to get them off your plate makes a world of difference! Thank you 🙂 Yes, these tips will absolutely help people who have insomnia as well. Thanks for the note! Sleep is so important for our overall health. I love a nice hot beverage at night, it can really help the body relax. I also love the idea of getting a noise machine. It always calms me when I turn on white noise for my kids. These are all great tips as I am all for establishing an effective night time ritual for a good night’s rest! Drinking tea and using essential oils I have found extremely helpful. And a surefire tactic has been putting down the phone and picking up a book. I love to read and it’s one of the quickest ways I fall asleep. I enjoyed this read a lot. Since our son was born, my wife has been losing a ton of sleep to anxiety issues. Hopefully some of these suggestions help! These are great ideas! Planning ahead can rid us of all kinds of anxiety throughout our day. My nighttime anxiety is always all about lack of money and a huge stack of medical debt. It is really hard to erase it all from my mind when it is such a huge struggle for our family. Thank you for the tips! I am going to have to try this so I can put my mind at ease! These are great tips! I use a lot of them, but I’m excited to try the others – especially trying to stop using my phone in bed!! I aveb trouble shutting my brain off sometimes at night! I have used lavender and it helps, but I may try the getting rid of technology and reading a good book! Thanks for the suggestions! I just started using a lavender roller ball scent stick. It has been great. I really need to stick with the bed time routine. I helps so much when I do it; I need to really make this a habit. In the winter I love Celestial Seasonings Cinnamon Apple tea. Great list of tips and reminders. These are great tips. Preparing for the next day and taking a few minutes to make sure the heavy traffic areas of the house are clean has been transformative for me. My hubby and I also started doing pre-bed tea. It’s such a great way to calm down and check it with each other! I don’t have anxiety personally, but I know a few people who do, and these are so good and helpful! Thank you! I love all these tips! The one that helps me the most is getting stuff done /prepping the night before. And lavender. I know we should keep technology out of the bedroom to reduce nighttime anxiety but I can’t live without the Insight Timer app on my phone! I make sure to turn my phone on silent mode so I don’t get any notifications for messages but I use this app (free by the way) to listen to meditation music or guided meditations. There’s one particular track called “Floating” in this app that’s a huge life-saver for me. I turn it on and I just let my mind focus on the soft music and I could fall asleep within minutes.